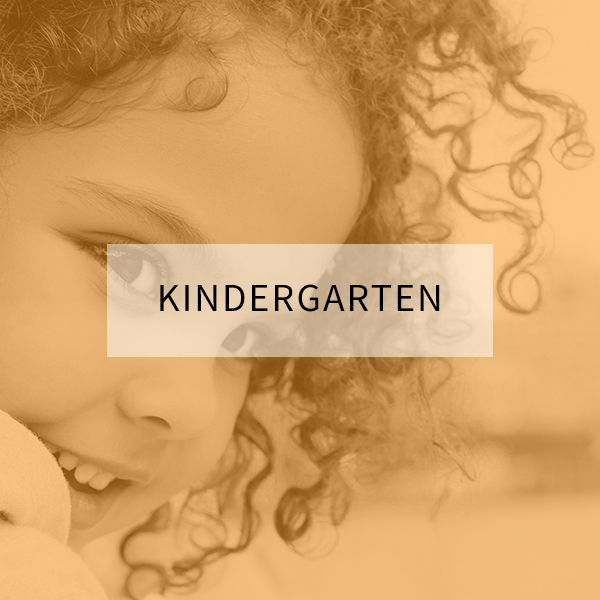 As a mom of many, we spend a ton of time in the car going to the various events. We need to make the time worthwhile. 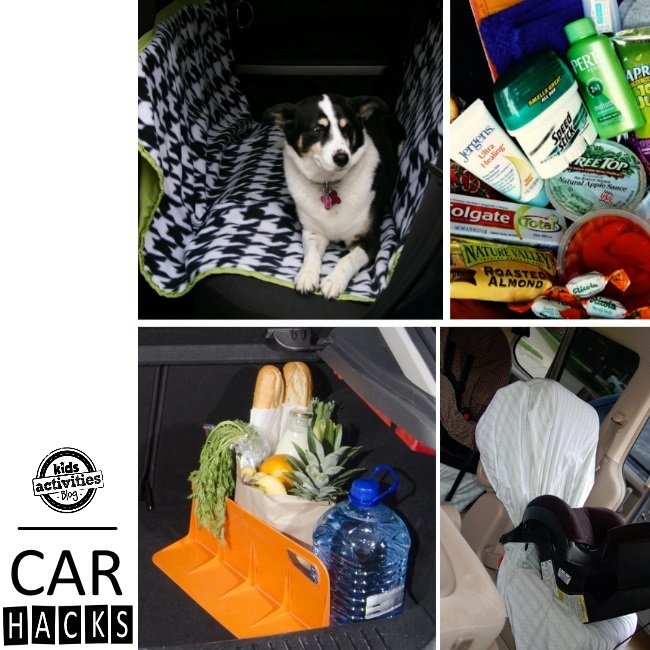 Make the time spent in your vehicle more organized, more efficient and less stressful with some of these car tricks. 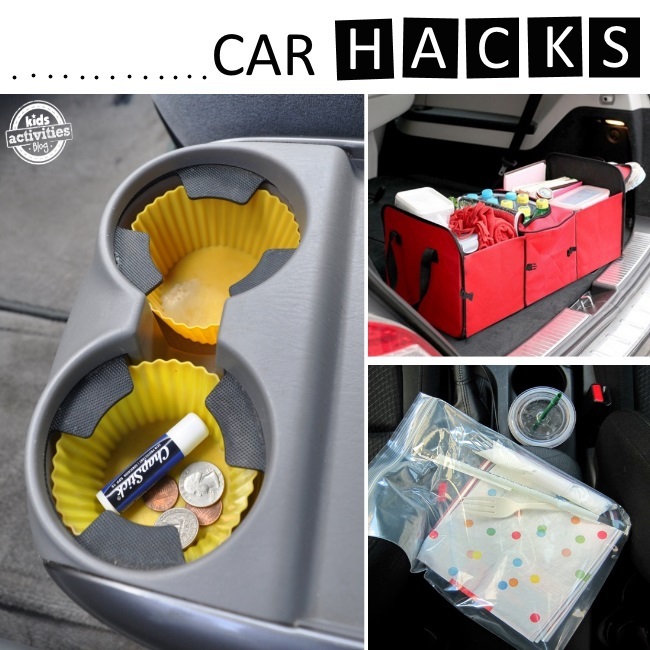 Like these car hacks? You will also like this article of garage organization ideas. 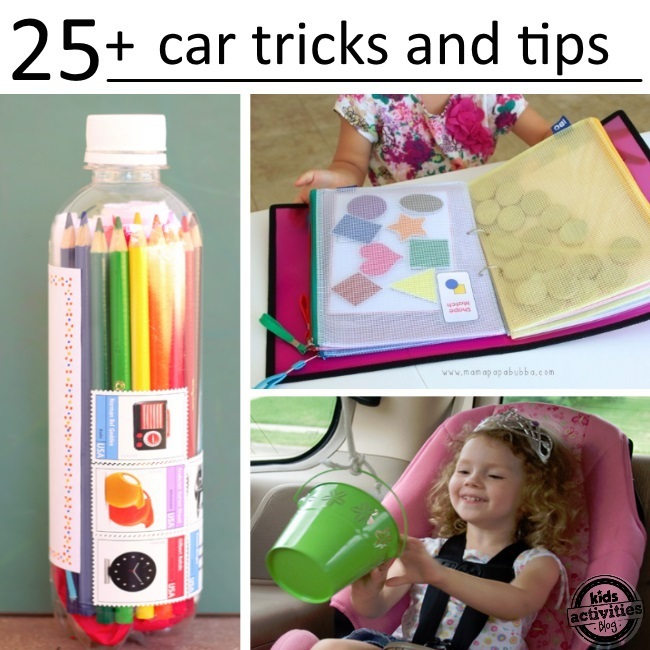 Help entertain your kids with a DIY travel book. 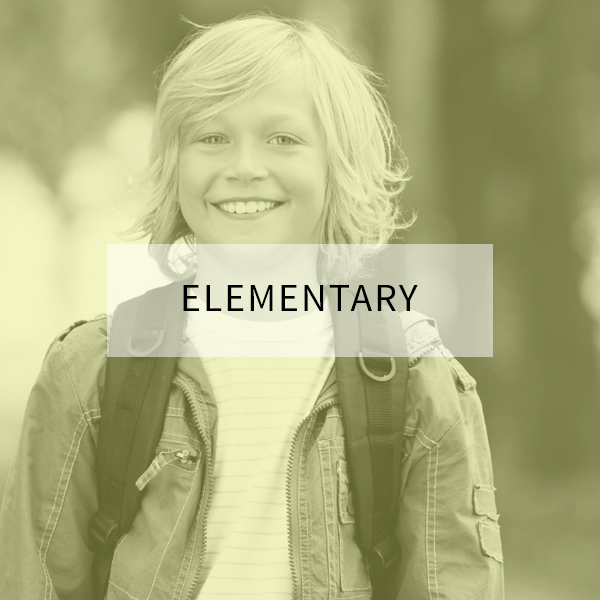 You can create pages of activities for your kids to do independently in their carseats. Send yourself a message in a bottle to remind yourself of all the fun you are having on an outing together. Create a bucket pulley system. 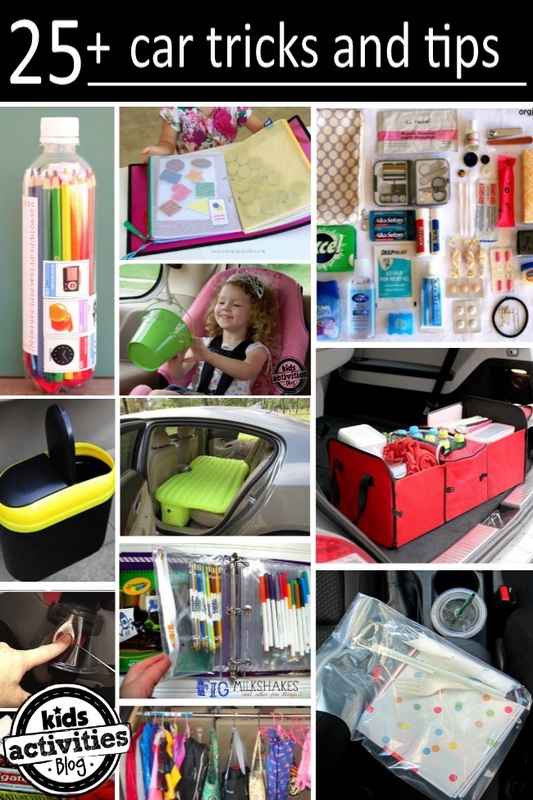 This is great to get things to the back of the car without stopping on long trips. Be sure to secure or remove the bucket between hauls. Keep the baby binkie clean. Carry spares in condiment sauce containers. When one gets dirty, just open another container. Create a temporary tattoo of your phone number. 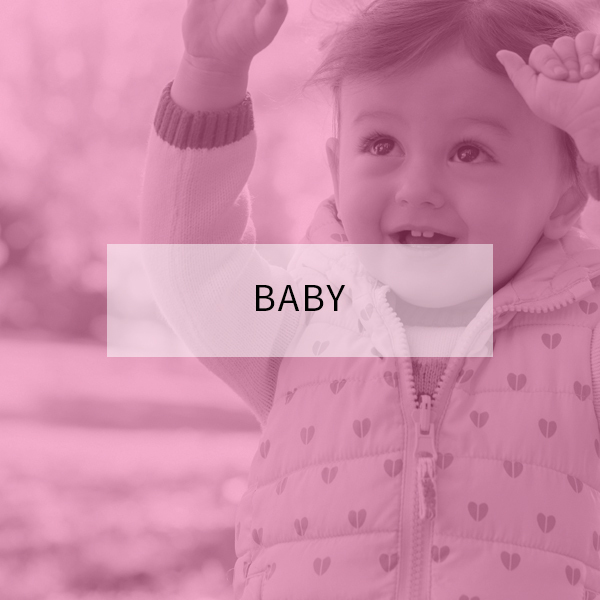 Put it on your child’s hand when you are traveling or at a busy event. If they get lost they can tell someone how to reach you. 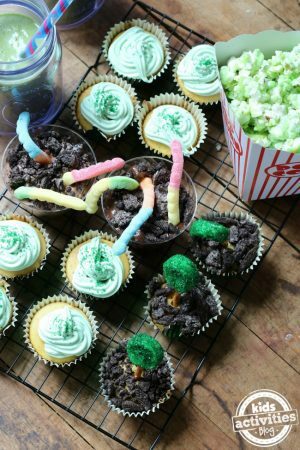 Have you tried everything and still can’t get the kids to calm down in the car? 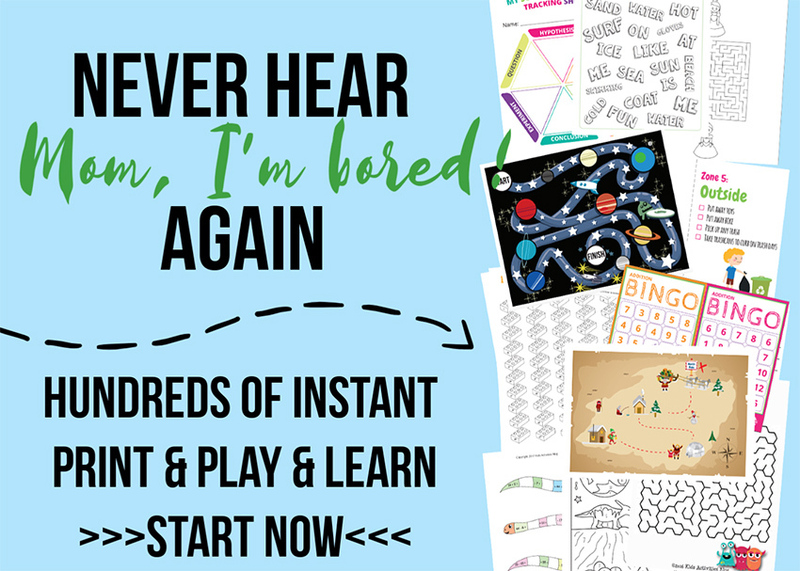 Let them play on your phone, but give them an app they can learn from! No more trying to dig coins out of a cup holder (not even to mention trying to clean the little bits of lint and crumbs that get stuck in the crevices. 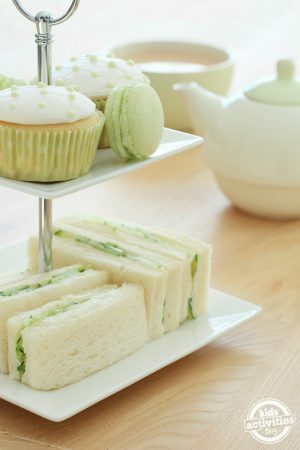 Use silicone cup cake liners (affiliate) as inserts for your cup holders. When they get grubby, wipe them out. Have a single serving tableware ready for an unexpected meal on-the-road. 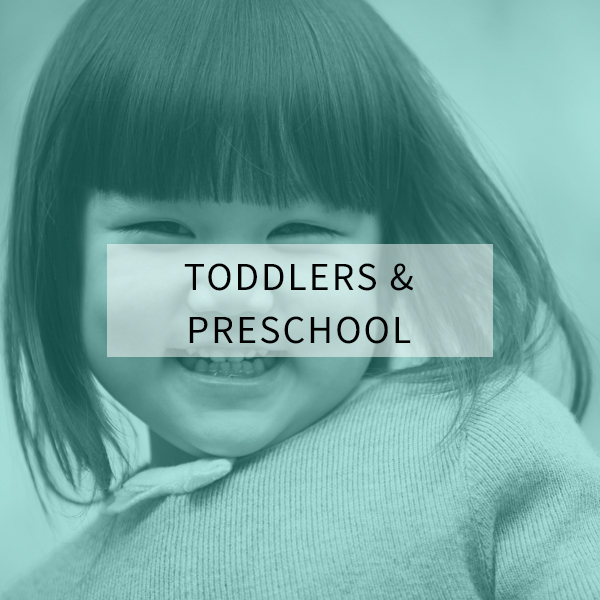 Stephanie over at Modern Parents Messy Kids keeps a couple sets in her glove box. 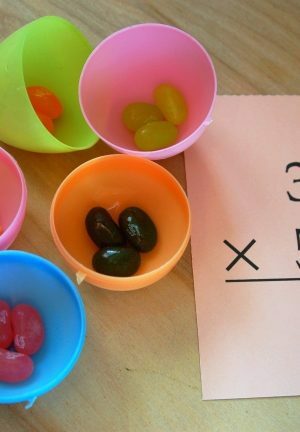 Use Easter Eggs as snack packs. 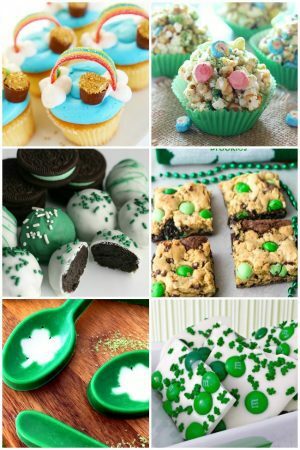 They are easy to pass out in the car and perfect for portion control of snacks while you drive. DIY Dog blanket. Bring your dog with you – and keep the car clean. This is a hammock style one that attaches to both seats. BUT, if you have a still dog, consider using a tablecloth. Cover the seats with a fitted crib mattress sheet. You will protect the seats. Scotchguard it for extra protection from spills and crumbs. I am not the only one who bought milk and they worried the whole way home wondering if it toppled over… worry no more with this nifty “stay hold” – it keeps groceries upright in the trunk. If it does spill – here are some genius car cleaning tricks that can help. Is your favorite travel mug dirty? This is a genius trick to transform any mug into a splashproof travel mug! All you need is some cling wrap! More Genius tips via video, so check out their channel. Saving the funds for a vacation does not have to hurt the budget. Save up for your trip painlessly – with a trip-bottle. Collect Bags of Blessings to keep in your car. If you come across a person in need you can “be a blessing”. 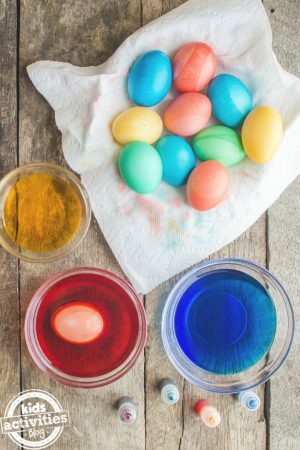 Create a kit for all the little things that you might need – ideas of things to add include antacids, nail clippers, extra cash, band-aids, Advil, etc. Organized Junkie has a terrific tutorial on how to customize your emergency kit. You can also purchase pre-packaged first aid kits (affiliate link) that can help in the time of need. 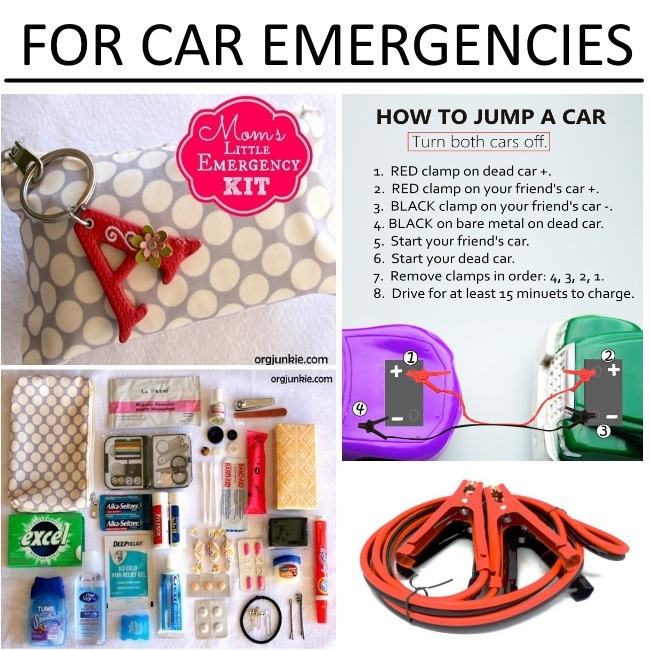 We have jumper cables in our car but the times my battery has been dead I have been lost as to how to connect the jumper cables (affiliate). Even if you don’t have a set of jumpers in your car, print this nifty tag just in case you need to jump another vehicle. If you use reusable tote grocery bags you will love this idea. 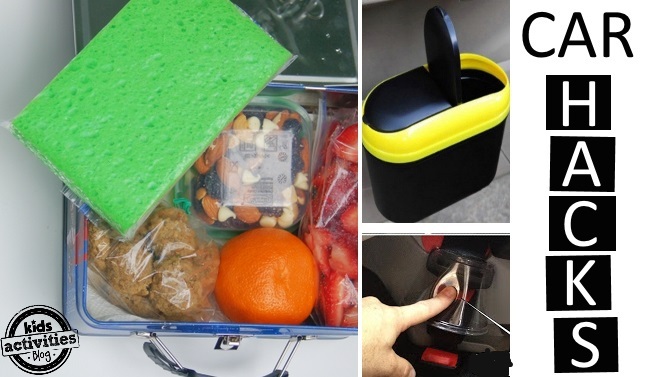 Fill a bin with the totes and keep it in the trunk. You have one place to go for all those bags. Thanks I heart Organizing. If you have a lot of driving this might be super helpful. I know there are days when my older kids have had back-to-back games, during nap-time!! This inflatable bed would have made resting easier on my tyke while the kids played/practiced. Poke a hole into the lid of a water bottle and add a straw for an instant “sippy cup” for an older child. Perk: Throw it out when you reach your destination. 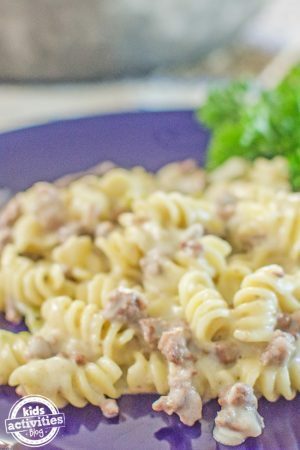 For more ideas like this one, check out our meals-on-the-go post. Don’t let all the bags and jackets pile on the floor. Use a tension rod – the kind designed for closets. You can hang all the kids things. Thanks Madame Deals for the idea! For those kids who figure out how to unbuckle their seats, but do it at all the wrong times, this trick is invaluable! Make a car seat belt “cover” using a small plastic cup. Genius! 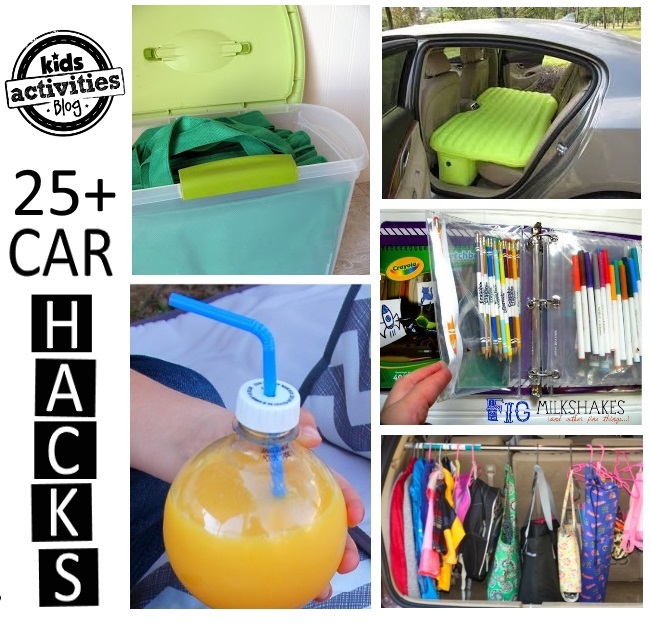 Organize the car and all the kids towels and other items that come with activities using a magazine rack. No more digging through stacks of things in the trunk. Put a pool noodle along the bed of a child when you are traveling in place of a bed rail. Your kids will hopefully stay in the “new” bed. Use a sponge as a back-up ice pack. No more drips from ice! Don’t have a sponge or have a larger thing to keep cool? Try a dish towel. Careful- some of these are not safe! As a longtime trained passenger safety advocate, I can tell you that people are often injured by projectiles in crashes. A police officer once told about an accident scene he’d been called to where a baby had been killed by a flying spoon! Always remember that any loose items in the car can do this. I keep Crayola twist up crayons in the car instead of pencils. They won’t melt like regular crayons and won’t impale anyone as they have a large rounded end. I can’t say this is ‘safe’ to do- there still is some risk- but less than pencils by far. I would never consider the ‘bucket pulley’. Maybe a ‘cloth bag’ version? And two of my own- for those little misc. items I always seem to keep in the car, I use a small soft-sided cooler. It contains the items and cushions them as well. I also keep Kleenex in a vinyl zipper pouch- safer than a box, keeps the tissues clean and won’t get crushed- win-win.